Have you seen the little bright turquoise building just past the Botanical Garden on Bayshore Drive? That cute building is home to The Best Popcorn Company. While they have been in the popcorn business for 15 years, they are new to the Bayshore Arts District Area. They wanted to set up shop in this area of town because this is “where everything is happening!”, said John Ginter. John owns the shop with his younger brother, Kevin Kurgis. It all started when their family started cooking kettle corn and selling it at the 3rd Street South Farmer’s market every Saturday. The business expanded when they bought out The Popcorn Cellar on 5th Avenue S. Already knowledgeable in taffy and candy making, their expertise led them into popular and trademarked flavors like the Naples Mix® and Chettle ® . The Naples Mix® is a combination of caramel and white cheddar “so your fingers don’t get orange at the wedding” and Chettle® is Kettle Cooked Cheddar. They now have over 50 flavors available but not all in the store at the same time. The business continued to grow as they added taffy and caramel to the official lineup and started setting up “popcorn bars” and supplying mini favors bags for guests at events like weddings, birthday parties, family reunions, and baby showers. Their business is unique in that they can make the popcorn and package fit to the needs and theme of the customer’s wishes. Their labels can be customized to reflect any city from south Florida up to Orlando. The popcorn mix can be customized to your tastes. Just head on in to their store to try a few flavors! 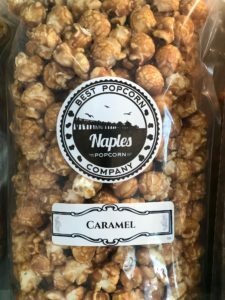 Popular flavors include the “Naples Mix” , Toasted Pecan, Kettle Corn, Traditional Caramel Corn, and Coconut Caramel Corn with Dark Chocolate Drizzle. For holidays and gifts, The Best Popcorn Company offers tins with three flavors or gift boxes with four flavors. They can be shipped or delivered. The store is a fun place to hangout. They offer ice cream and soon there will be a patio out front with additional seating and a place to rent bicycles. The only thing they don’t do is grow the corn themselves! What a fun new business in the Bayshore Arts District!